Throughout this Roadmap, we talk about higher ethanol blends being less expensive than gas or providing better margins than gasoline. 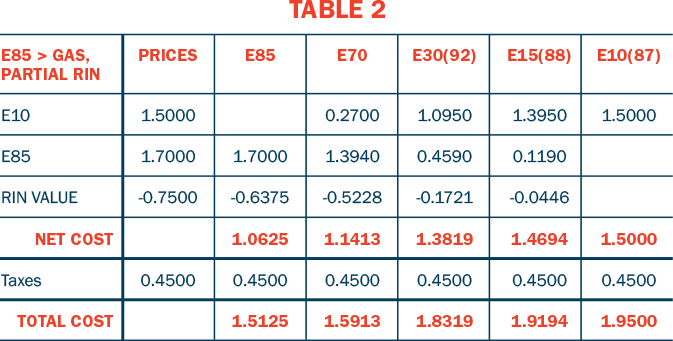 Over the past ten years or so, the rack prices of ethanol and E85 have usually been lower than the price of gasoline. However, that has not always been the case. Successful E85 and flex fuel retailers know what RINs are, what they’re worth, and how to use their value to lower fuel cost and increase volume and profits. 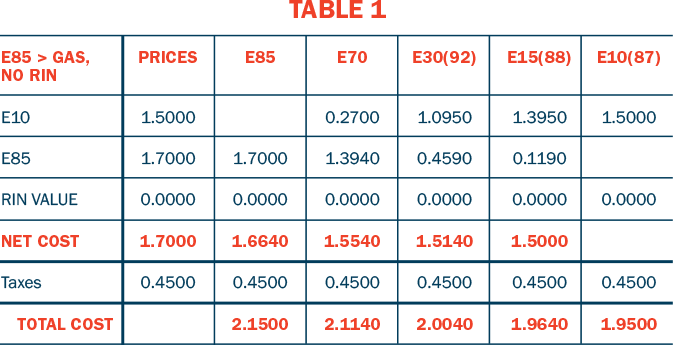 Table 2 shows the same scenario as the first Table, with RIN values reflected in the final calculations. Granted, RIN value is not guaranteed to hold until a blender has enough RINs to sell, yet successful flex fuel retailers find a way to use at least some portion of the RIN value to reduce pump prices and dramatically increase volume and customer traffic – while still earning a very healthy margin. RINs have risk associated with them, and most marketers would prefer not to take that risk. Fortunately, you don’t have to become a RIN trading expert to benefit from RIN credits. 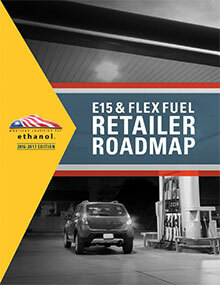 Knowing about RINs and/or letting wholesale flex fuel suppliers know you know (and expect to share in the value) might be all you need to be competitive in the E15 and flex fuel marketplace. 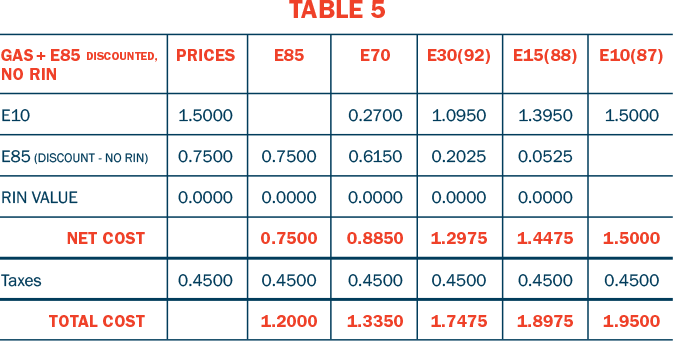 More and more wholesalers and even ethanol plants are selling E85 direct to retailers at a deep discount, which is made possible when the supplier keeps the RIN and uses a portion of its value to discount the price (see Table 3). The final prices aren’t as attractive as the previous example, but the retailer has no risk and no additional work in tracking and trading RINs. 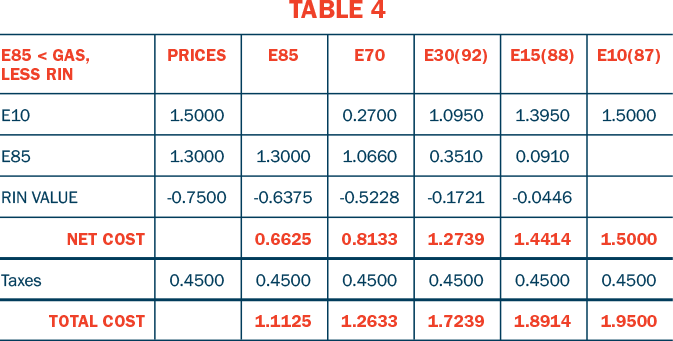 Tables 4 and 5 are example of the same types of transactions with pricing reflecting a market that has been more typical in the last decade – ethanol price is lower than gasoline. Again, the prices are only for illustration, and Table 4 assumes the retailer receives that RIN, while Table 5 is an example of a “RIN-less” ethanol price with the retailer. Finally, don’t forget octane. E15 made with 84-octane “v-grade” will have an AKI octane of at least 88 – a full point higher than E10 or E0 regular. A mid-level blend like E30 has an octane rating higher than straight premium gasoline. While the price of the E15 will almost always cost less than regular, in the rare instance when it may not, remember the value of octane.